The biggest, fastest, most powerful fighter of its day, the McDonnell Phantom was an awesome war machine that came to dominate aerial combat for over two decades. It may have been the size of many World War II bombers but it could out-perform anything that crossed its path; The F-4 Phantom was the benchmark against which every fighter in the world came to be judged; it was simply the best. 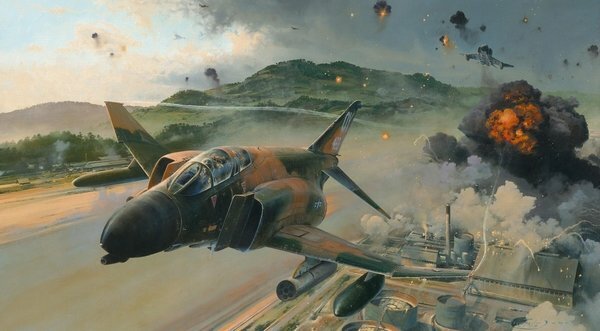 Robert Taylor’s powerful new painting depicts Steve Ritchie, first into action, flying his lead F-4D Phantom through a hail of deadly enemy flak as he exits the target area after a typical FAST FAC mission on enemy installations in North Vietnam, 1972. Behind him a vast trail of devastation marks the mission’s progress, as his fellow Phantom crews continue to wreak havoc with their heavy ordnance, the target area exploding in a series of mighty detonations. Born in June 1942 during World War II, Steve Ritchie graduated and was commissioned from the USAF Academy in June 1964. He flew his first combat tour in Vietnam in 1968 on Fast FAC operations, before transferring to the 555th Tactical Fighter Squadron, 432nd TRW for his second tour. It was with the 555th TFS – the famed ‘Triple Nickel’ Squadron, that he achieved Ace status. His first kill came on 10 May 1972 when he downed a MiG-21 forty miles northwest of Hanoi, with his second a few weeks later just thirty miles south of the Chinese border. At the beginning of July he downed two MiG-21s west of Hanoi. It must have been his lucky area for on 28 August he scored his fifth and final victory in the same spot, thus becoming the USAF’s only pilot Ace of the Vietnam War and the last US pilot to acheive Ace status. Flying his first combat mission on 5 October 1965, leading fighter pilot John Madden flew three combat tours in Vietnam, notching up an impressive record of 3 kills and 1 damaged, flying F-4's. On 28 August 1972 he was part of the same mission when Steve Ritchie made Ace. That same year Madden led over 50 combat flights and he never lost a wingman. Flights under his leadership accounted for 5 enemy aircraft downed, and 1 damaged. He left Vietnam in 1975 and retired from the USAF in 1984. These specially produced collectors pieces are reproduced on the finest grade canvas. To replicate the artist’s original painting so faithfully, each print is individually worked by a specialist master printer laying down solid color on canvas, so that only the experienced eye can distinguish them from the original.